Catching up on some recent trips! I travel for work every so often and one of my more frequent destinations is San Francisco. When I don't have meetings or dinners scheduled I'm on my own to explore. I don't have much free time or close friends that live there so I try to make the most of it without venturing far from my hotel. I stayed at the Park Central (formerly Westin) on my last visit, which is an SPG property. Appropriately named, it was within walking distance Union Square and the Ferry Building. In addition to all the department stores and high end brands around Union Square, there is also a string of discount stores along Market Street including Neiman Marcus Last Call and Saks Off 5th. If shopping is your thing, you won't be disappointed. I've also stayed at The Fairmont, which is a beautiful historic hotel. It's also haunted (no joke, I had a bizarre experience with a voice on the elevator). Besides that, it was lovely. When I travel I try really hard to get workouts in . It happens more frequently when I'm on the West Coast because I wake up at 6AM in a panic thinking it's 9AM and I've overslept. In advance I'll check to see if my hotel offers a gym or if there are any studios I can drop into it. Yoga is usually easier to pack for and welcoming to newcomers. I'll bring a mat towel and don't need to pack sneakers. The last time I decided to finally give Soul Cycle a try since it was near my hotel. I'm a big fan of spin and can see why this studio has a cult following. Since I lugged my spin shoes in my suitcase I was committed to going. Before my flight home, I stopped by the ferry building for breakfast. It reminds me of Chelsea Market in Manhattan with several specialty and gourmet food vendors. There is always a long line at Blue Bottle Coffee so I hop right in. I had a baked egg sandwich with sautéed mushrooms, Gruyere, and herbs from Cowgirl Creamery Sidekick Cafe that was unreal. I was actually trying to go for something somewhat healthy... oopsies (I wasn't on the 21 Day Fix during this trip). Finally, I couldn't come home empty handed for Ted so brought home some Macarons from Miette. They aren't colorful because they don't use any artificial ingredients. One of these days I would like to visit their full shop in Hayes Valley. One of my favorite restaurants that I have been a few times with clients is Wayfare Tavern. It's great for both lunch and dinner and I love the old world decor. 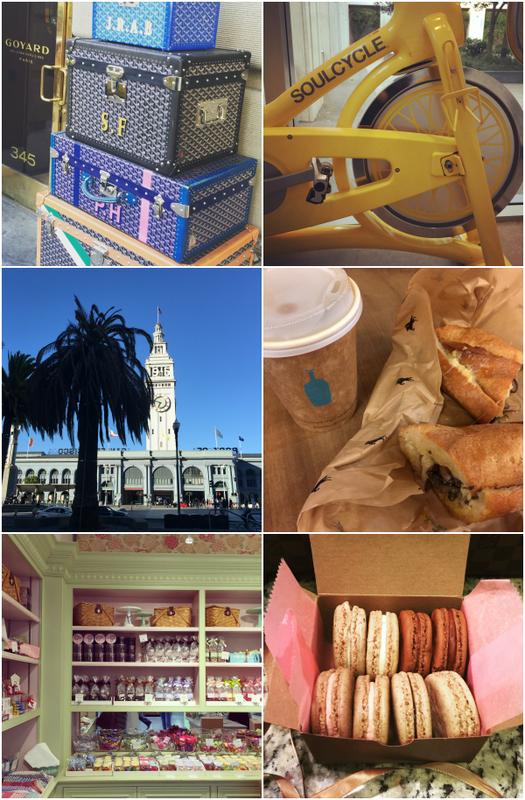 Any San Francisco favorites I should keep in mind the next time I go? Great recs! I've never been to San Francisco and it's on my list! You MUST go to Tartine Bakery next time you're here! Pastries to die for! Looks like you had an amazing trip.